Preheat Anova sous vide to 194°F. Trim and peel the squash with a sharp knife. Remove the seeds using a spoon. Slice into even, half-moon-shaped pieces. The pieces should be about ¾-inch thick. Arrange your squash pieces in an even layer in one or two sous vide bags. Sprinkle with oil, salt, and pepper. Seal the bags with a hand pump or a vacuum sealer. When the water bath is ready, drop the bags into it and cook for 30 minutes. In the meantime, combine vinegar, honey, and Italian seasoning in a small saucepan over medium-low heat. Simmer 5–6 minutes or until mixture reduces by two-thirds and thickens. Remove tough root ends from the Brussel sprouts and thinly slice them; place in microwave-safe bowl. Cover and cook on high heat for 4 minutes. Drain well. Cut pear in half and remove core, then slice. To serve, divide Brussel sprouts evenly on four serving plates, add pear slices and sous vide butternut squash. Drizzle with the balsamic sauce. Add more salt and pepper if needed. Enjoy! 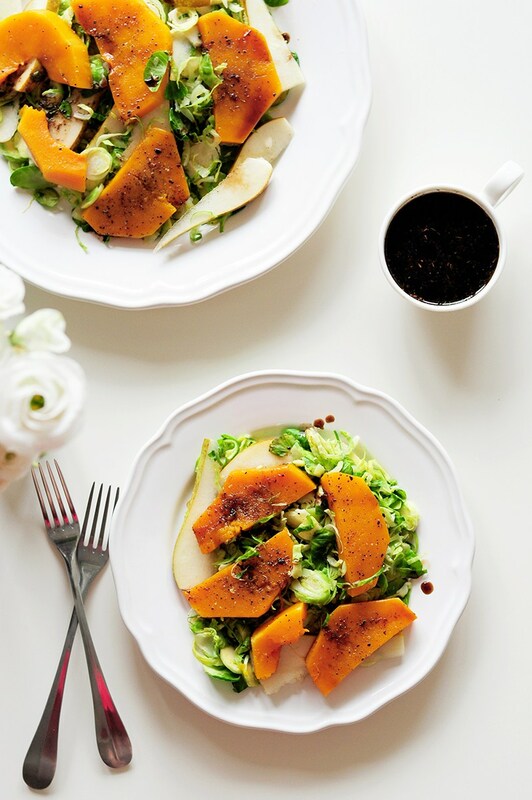 This sous vide butternut squash salad is the perfect antidote to boring weekday lunches. 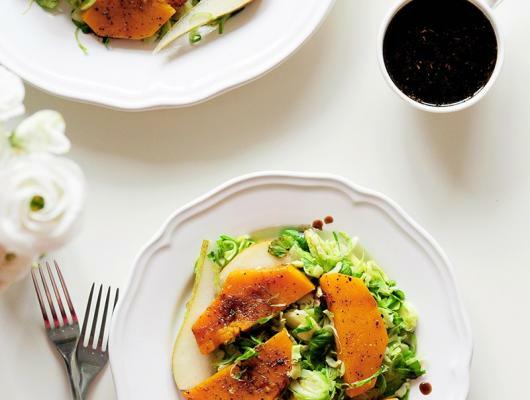 The butternut squash adds a subtle sweetness, and you’ll get an extra punch of flavor from pears, Brussels sprouts, and a homemade balsamic vinegar glaze.